Heather Mitchell is one of the great treasures of the Australian stage and any chance to see her must be grabbed eagerly, as proved to be the case even in a work as unsteady as Force Majeure’s You Animal, You. Under its founder and former artistic director Kate Champion, Force Majeure created a body of dance-theatre work that combined movement with text and often included actors alongside dancers. Mitchell has collaborated with Force Majeure before and is a riveting presence in You Animal, You, directed by Champion’s successor Danielle Micich (and including text written by Mitchell). You Animal, You looked marvellous and was performed with passionate intensity. Its effects, though, came from a scatter of individual moments. A coherent whole failed to emerge. The work, choreographed by Micich and the performers, put forward the not entirely novel proposition that we hide the primal urges that drive our true selves. Strip away the shield and we will be revealed and possibly freed. To that end Mitchell commanded a rag-tag band of two women and two men who seemed to be her slaves, up to a point. Dressed in a long sequined gown that had seen better days she shouted directives through a megaphone, sometimes sitting in judgment from a vertiginously high seat that could be wheeled about the space. The audience was seated arena-style in two rows of seats ranged around a long, wide oval. Bay 20 at Carriageworks is large and the spare design made it seem even more so. The top-tier team of Michael Hankin (set and costumes), Damien Cooper (lights) and Kelly Ryall (score) created a chilly dystopian environment that nevertheless had a certain elegance and grandeur. Mitchell was perhaps a distant cousin of Mad Max Beyond Thunderdome’s Aunty Entity, her glamour somewhat faded but her resolve firm. When she told two people to get into the centre ring and fight they did it without hesitation. When she barked the order “let’s dance”, everyone complied. But to what end? The stage picture was always vibrant and visually appealing but its meaning elusive, other than the symbolism of the amphitheatre as a place of conflict and the huge plastic bag used early and late in the piece as an obvious stand-in for the womb. The vague unanimity of the first part of the piece fractured into fragments of memory and individual dances but nothing really stuck. There were solos for each of the four dancers in the cast – Harrison Elliott, Ghenoa Gela, Raghav Handa and Lauren Langlois – and sections in which language predominated. Langlois had a stream-of-consciousness monologue that drew on synaesthesia; Mitchell told a fable about the food chain and spoke movingly about the intimacy and pain of motherhood; Elliott relived the moment of birth; Handa spoke about breath; Gela sought refuge among audience members and then very sweetly thanked them. Each performer had distinctive personal and movement qualities that made them eloquently individual and therefore worthy of close attention. You wanted to know more about Gela, who greeted people warmly as they filed into the space, and Elliott, who slowed time with a naked dance of evolution from flailing baby to dignified adult. Touchingly, you could see that Mitchell was a non-dancer among dancers (you could also see her knee and ankle braces; dance is a tough master). She moved expressively though, losing herself in that special place that civilians have when dancing. You Animal, You had a very brief premiere season at the Sydney Festival and there are no further dates listed for performance at this stage. Despite being devised with the assistance of a dramaturg, director Sarah Goodes, You Animal, You doesn’t feel fully developed, which is possibly why it ran only about 55 minutes rather than the advertised and presumably planned 75 minutes. IN the guise of a sweet and playful romance, As You Like It drives its characters (and ourselves) to seek answers to life’s deepest questions. Who am I? What is my purpose? What is my rightful place? As the story begins the world is in disarray. A ruler has been usurped, an arrogant man refuses to fulfil his responsibilities towards his younger brother and a woman, Rosalind, is wrongfully banished from home. She escapes to the Forest of Arden where all is made well. Wrong-doers repent of their sins, lovers find their right match and order is restored. Taking on the guise of a boy, Ganymede, Rosalind is the prime mover of events; the director, if you will, as well as a player in the comic roundelay. 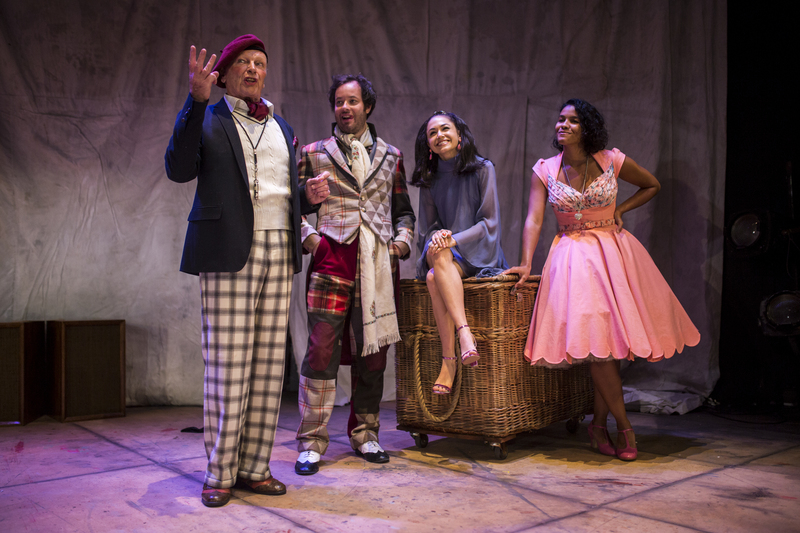 Peter Evans’s production for Bell Shakespeare skips rather too lightly through the thickets. The suggestion of a 1950s setting gives an opportunity for some very pretty frocks (by Kate Aubrey-Dunn) and finger-snapping tunes (Kelly Ryall) for the songs but confers no great insights. Michael Hankin’s set design – saggy canvas backdrop and a “forest” of flowers on hanging ropes – is almost perverse in its refusal to make theatrical magic. Jaques famously describes all the world as a stage, but in this As You Like It all the world appears to be gathered backstage. And yet, there is, in Zahra Newman’s Rosalind, a shining tribute to powerful women that is extraordinarily potent in the light of today’s politics. She is an acute thinker, has courage, resourcefulness and is a person of action in thought and deed. Newman bounces about the stage with enlivening vim and vigour. She makes things happen. Only the most cursory nod is made to her assumption of a male persona as Evans gives a wide berth to contemporary gender politics. Newman wears a suit that does nothing to disguise her womanliness. It’s a costume that allows her to exert control. There are losses, and some may find them too great. Evans makes nothing of the difference in temperament and style of the rustic folk in the Forest of Arden and the escapees from court and Shakespeare’s boy-girl, girl-boy confusions are excised along with the attendant laughter and inherent complexity. But the gain is in the fierce concentration on Rosalind as a woman of wit and substance who will lead us to the heart of the matter as others flail about blindly or, in the case of John Bell’s brilliantly dry Jaques – an accountant type with notebook and pencil – privilege thinking over feeling. Evans’s cast of 11 is attractive and funny (well, Gareth Davies finds it hard to make Touchstone amusing but he’s not Robinson Crusoe in that). Charlie Garber’s Orlando had women at the matinee I attended audibly sighing in sympathy with him and what a treat to see Tony Taylor (doubling Adam and Corin) back on stage. Overwhelmingly, though, it’s Newman’s show. Ends March 28. Canberra, April 7-18; Melbourne, April 23-May 10. A version of this review appeared in The Australian on March 3.